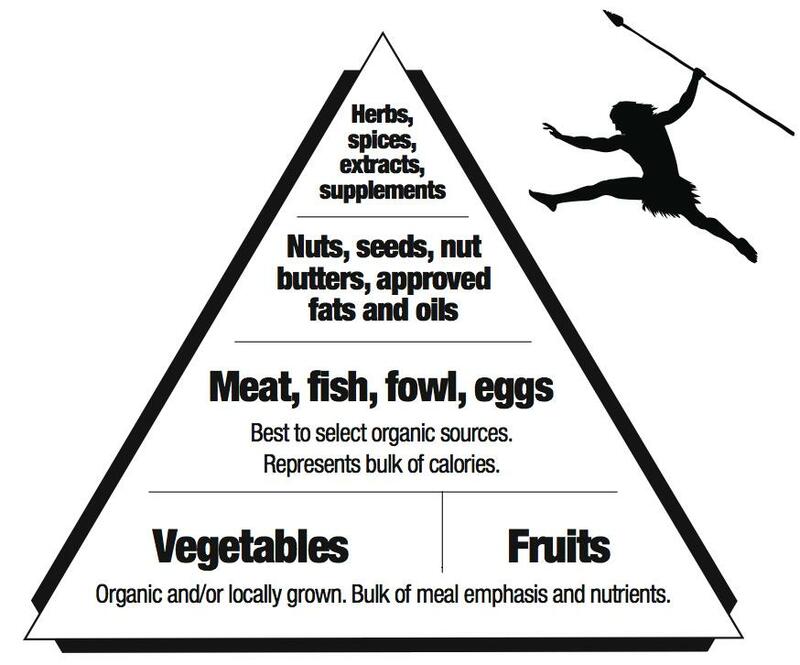 What would a paleo food pyramid look like? This idea caught my interest when I was thinking about how the USDA food pyramid makes grains the foundation of a healthy diet. I searched through Google Images and looked at some images of paleo food pyramids. I was disappointed to say the least...some did not make sense. Some put berries into the same category as nuts, as if berries weren't fruit. One had water as the foundation, but water isn't food (I don't think something that has zero calories can be considered food). Mark Sisson's Primal Pyramid was my favorite. Yes, meat is good for you. Also fruits and starchy vegetables - other veg as well too. Grains? Well, wheat, rye, barley etc are just not good. Reading on here will be a good place to start. It's OK but I think it would be better with carbs shown between veg and fruit, i.e. white potatoes, white rice etc. And there are no fats shown, which for me is a huge omission. I also like this one. Especially as it has a decent amount of carbs shown. Gilliebean, awesome blog. Love the gizmoto meat pic:) ill put you on my lil blogroll. i like the straightforwardness of your pyramid. Benjamin is just a hunter and does not like to gather. Don't be mean to him. So what the heck was the gather part of hunter gatherer for? Collecting a few eggs and some fruit? So we should completely trash something that is admittedly useful? Helpful. Do I see PEANUTS at the top of the corrected pyramid...?! I really like this pyramid too. I would only cut in half the "dairy" part, and add "other fruits" there. May I use this for a blog post if I credit you, Dana M? This is the best "Pyramid" I've seen in reference to describing Paleohackers specifically (meaning, the all-encompassing "Primal/Paleo/PaNu/Omnivore/VLC Paleo" universe we face here) Good Work! I really like this, definitely closer to my diet...thanks! LOL I'd rather they stick the coconut oil into a tub than have it spill everywhere. Wow, I really like this one!! Good job! Paleo doesn't only eliminate grains, legumes and sugars. It also emphasizes good food sources. Therefore, Grass-fed is optimal; but it is not the only option. I think it's important to mention it because most paleo folks believe that it is optimal. Seafood is supposed to be encompassed under "healthy fish." But good suggestion... I should have separated it out into two separate items - fish and other seafood. i think seafood would be a good addition. I love this, but I realised that most of the core bottom row items are in a container of some sort, making them appear processed, which seems a little anti-paleo. Wow, I like this. Thank you, gilliebean. This is an amazing question. Can't wait to see the answers! I would emphasize zero grains. 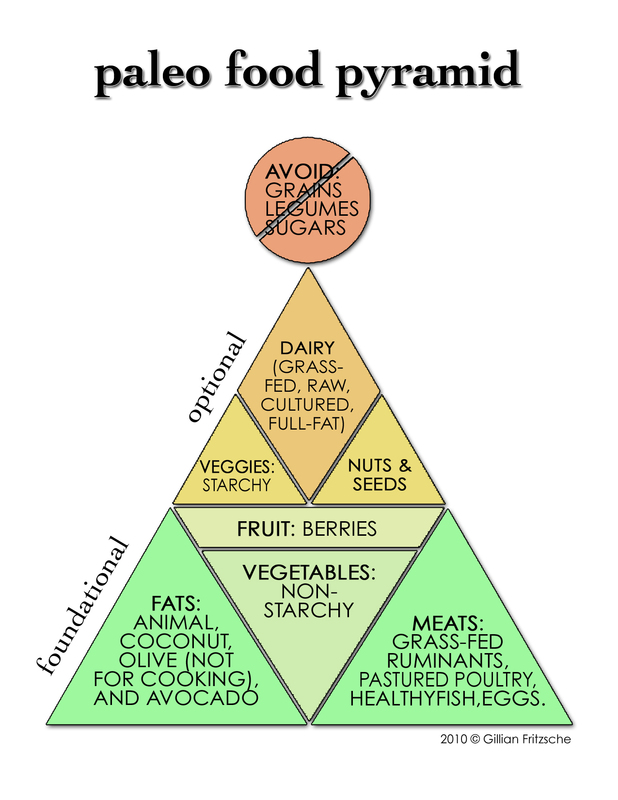 I don't agree with Mark Sisson's pyramid or the Primal Food Pyramid. There are just two categories as far as I'm concerned. The base of the triangle is meat, fish, poultry and animal/saturated fats. The upper, smaller section is vegetables, fruits and nuts. And I wouldn't specify grass-fed. You may think that's preferable, but many folks don't have access to it or can't afford it, and all that does is alienate them. This one is simple for me. I really like the paleo "base camp" of fruit/veges, meats, nuts and seeds. I"ve found by following this eating principle on an 80/20 basis, I'm a much happier person and feel so much better every day. However, everyone is so unique and individual that experimenting with what works for each person's body is important. High quality yoghurt, cheese, kefir, ghee and butter are awesome from a health perspective and taste bloody fantastic, so if you suffer no intolerances, why not eat them....in moderation of course. Same goes for grains - especially for high level athletes. Rice and quinoa are great carbs and satisfying - although as you probably know, quinoa is from the grass family and not a grain. At the end of the day, the paleo pyramid is a solid foundation which should be tweaked to each individual's unique needs. 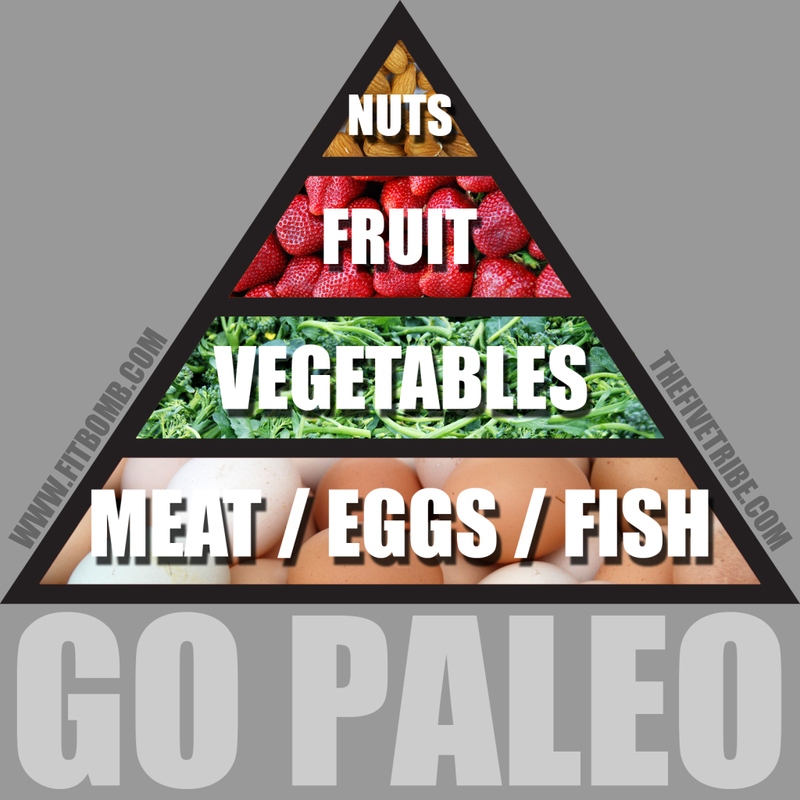 This is Primal, but check out this Primal Food Pyramid. Benjamin is just a hunter and does not like to gather. Last time I checked my dad died of a heart attack from eating to much bacon and eggs, not steamed rice, veggies and fruit. You guys are trying to tell people that meat is good for them and whole grains, fruits, and starchy vegetables should be eaten sparingly? Not only would I die prematurely from eating that way I would perform so poorly in sports that I wouldn't be able to play anymore. Do some more research and get educated. these are all awesome. seriously good work guys (well, i knew the grok one but awesome seeing all the others. I think vegetables should be compltetly trashed, its been proven agriculture was started in eygpt about 10,000 years ago, before that (and for many people even after so) it was primairly, MEAT,eggs fish & fruit. I really don't beleive excessive reliance on agriculture is healthy for humans, the earth or plants. admittedly, some plants are useful to humans.